In 1763 an Ottawa chief named Pontiac declared war on white settlers in the Pennsylvania area to preserve Indian lands. During that war, the coalition of Ottawa's, Delaware's and other tribes suffered their first major defeat at the hands of the British forces at an area known as Edge Hill, near Bushy Run. The British, marching from Carlisle to relieve the garrison at Fort Pitt, were ambushed on August 5, 1763. The two-day battle ended when the British commander, Colonel Henry Bouquet, executed a brilliant maneuver and tricked the enemy into thinking that he was retreating, thereby drawing the Indians into a trap. When the gun smoke cleared, both sides were faced with the task of burying their dead and seeking aid and shelter for their wounded. The British continued on to Fort Pitt which was sixty miles away, and the warriors returned to their vil­lages, some of which were as many as a hundred miles distant. 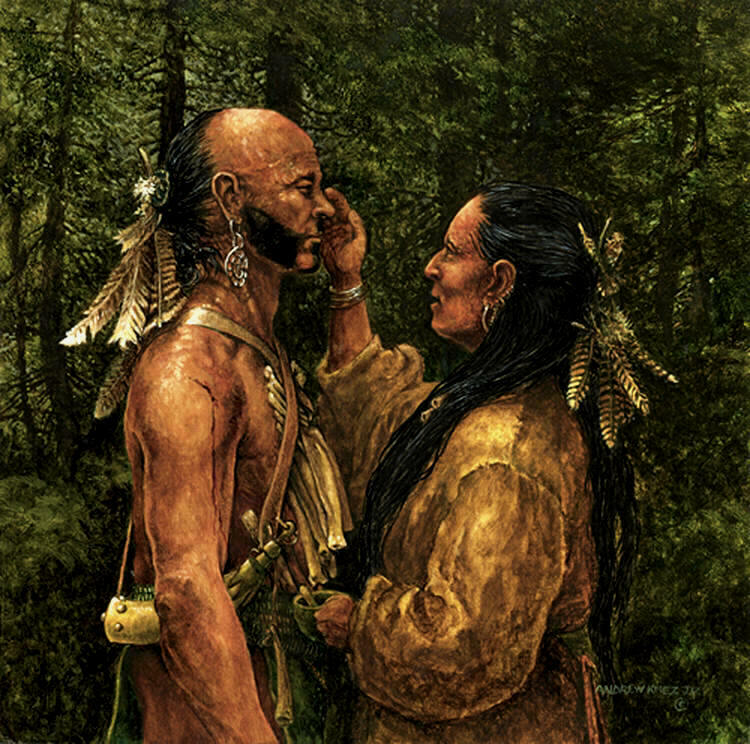 This painting depicts a fictional Delaware woman named Otaes (flower) treating the wounds of her man, Chinque (bobcat), who has just returned from that battle.